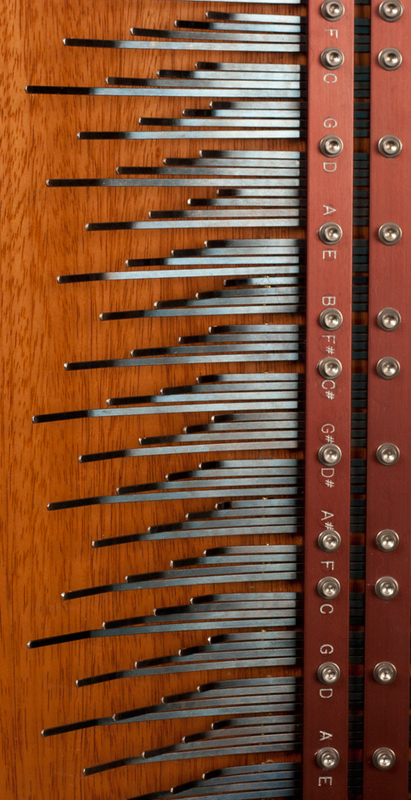 The Array mbira is a modernized version of an ancient musical instrument. Mbiras are part of a family of instruments known as lamellophones. These types of instruments usually have metal tines that are attached at one end to a solid piece of wood or a hollow wooden body. The tines are tuned by adjusting their length. Traditional mbiras and many other types of lamellophones generally have 9 to 24 notes (tines) and are tuned to a limited scale. Array mbiras contain the same notes that are found on a piano and therefore can play in any scale. Lamellophones are most commonly referred to as thumb pianos or kalimbas but are also known as mbiras, sanzas and likembes. At Array Instruments we have taken inspiration from these ancient instruments and applied the Array System of Note Arrangement to create a modern musical instrument that plays all the notes of the western 12 tone scale in up to 7 octaves. In other words, an Array mbira can be played with any instrument that shares the 12 tone scale, such as pianos/keyboards, guitars, woodwinds, strings, etc. History of the Array mbira. In the 1980’s, Bill Wesley began experimenting with ideas for a type of lamellophone that would include all the notes of the western 12 tone scale and play those notes in multiple octaves. After about 3 years he came up with what is now known as “The Array System of Note Arrangement” which places the octave notes in a column and the columns of octave notes are laid out according to the circle of fifths. Over 30 years later and with over 300 instruments in the world, Array Instruments has reached a pinnacle of perfection and sophistication unequaled in any other instrument of this type. …was born into a family of scientists, artists, and writers. In this lively intellectual atmosphere he became interested in a wide range of both scientific and artistic subjects. In the 1960s he began to produce shows featuring live musical composition and live visual animation. To facilitate better sound and light in these shows he designed various new types of instrumentation. In this spirit the array system of note arrangement was conceived and first applied to the Mbira. Subsequently a midi controller was developed and patented under the name The Sensor Array Midi Controller. Bill continues to invent new forms of visual and sonic instrumentation and to perform live, often with the Sound and Light Ensemble.